1st Prize: Your remix Published on Breakz R Boss Record, Free Mastering, Complete Breakz R Boss Back Catalogue, Breakz R Boss T-Shirt, Breakz R Boss Decals Pack. A Feature & intervew on www.breakbeat.ca website. & Custom DJ/Vocal Drop From BBK for your next live show or upcoming Mix!! 2nd Prize: Your remix Published on Breakz R Bos Record, Free Mastering, Breakz R Boss Decals pack. 1hr Guest Dj radio spot on Hosers In Toques radio show on nsbradio.co.uk. - All Bass Music Genres are excepted in this remix competition form all ages and experience. - All samples in this remix pack are copy written and are not to be used outside this remix competition. - Please note: Soundcloud favorite Counts and Comment Counts will be taken into consideration. So tell all your friends. 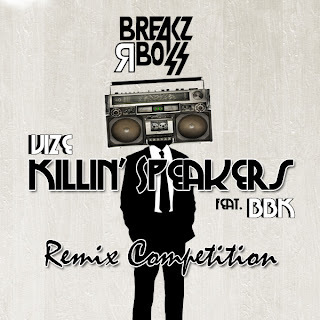 - Track ID tag must be named correctly when submitting/posting on soundcloud: Vize – Killing Speakers FT BBK (your name) Breakz R Boss Records Remix Competition. Portland’s Mitchell Hanson aka DJ Vize is regarded as the Pacific NW’s most prolific breaks artist, and one of the top breakbeat artists in the USA. His combination of dj skills, dozens of heavyweight-charted vinyl releases and remixes, and mind-blowing live synthesizer chops remain virtually unparalleled, with a slew of coast-to-coast appearances over the last decade that have put Oregon on the breakbeat map. Vize’s first breaks releases helped Florida’s Static System Music grow to one of the top new domestic breaks labels, with ‘Jammin’ Ya Tekz’ securing a spot in Beatport’s Top 10 within days of release. His productions and remixes consistently make a splash on the worldwide breaks charts, his latest remix of Tribal Riot’s “Lights” peaking at #2 on Beatport’s breaks releases chart. Vize has steadily built a discography of critically acclaimed vinyl releases on respected domestic and import labels, including: Ridiculoud, Static System, 13Breakz, VIM, Kick It, Born Idle, Breakz R Boss Records and more. His tracks have received major support from Krafty Kuts, Bass Kleph, Under This, Far Too Loud, Jay Cunning, Mo-bius, Breaking News, Fisso & Spark, General Midi, BLIM, Stereo 8, Ghettface, Capoeria Twins, Perpetual Present, Vlad Sokolov, J-Bass, Digibox, Duane Barry, Jurassik, Ben & Lex, Angus Robinson, Madame Mercury and the list goes on. He has appeared at major venues from Vancouver BC to Las Vegas to Florida and a wide variety of places in-between. His DJ sets and original tracks have been featured multiple times on Portland’s KNRK 94.7FM and Seattle’s C89.5FM, as well as internet radio shows iBreaks.co.uk, BreaksFM, Nuskoolbreaks.co.uk, Proton Radio. His music has also appeared on the Annie Nightingale Show on BBC Radio1, being named a 2009 “Mover and Shaker in Breakbeat” by Annie. Combine all this with an energetic, synth-driven, keyboard-skills-flexin’ Live PA and you have one of the USA’s most dynamic young breakbeat artists! Debuting in March 2011, BBK’s very first EP “HEADRUSH” hit #22 on Beatports Top 100 Breaks with the CURTIS B remix. Since then, he has released 11 Diff Originals on 9 diff labels. Hitting The Top 100 break charts 6 times and Dubstep once ( #12 Cool Project – Space Age Flow ft. BBK and MC Loc-E “Dylan Kennedy Remix) He has worked along side artist such as : Defunct!, Curtis B, Access Denied, Flatland Funk, Dr Who, Perfect Cell, 2Complex, J-Double, J-Roc, Allen Breakz, William Vandyke, and many more great producers. 2011 was huge for him! 2012 will be even bigger!